Provide secure emergency power with new facts and advice only in the 2016 NFPA 110 Handbook PDF. Recent extreme weather events have raised serious issues concerning flooding and fuel issues related to emergency power supplies. The 2016 edition of NFPA 110 has the latest coverage for designers, engineers, contractors, installers, and facility managers of any building that requires a backup generator or similar emergency system according to NFPA 101®: Life Safety Code® or another code. 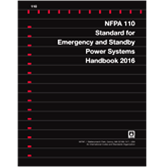 Apply the revised Standard correctly with added visuals and advice only in the exclusive 2016 NFPA 110: Emergency and Standby Power Systems Handbook PDF. This digital resource provides extra information that helps you ensure systems are ready in the event that the primary power source fails. In addition to the latest requirements, the 2016 NFPA 110 Handbook PDF adds expert commentary on the "whys" behind the rules for power sources, transfer equipment, controls, supervisory equipment, and related electrical and mechanical auxiliary and accessory equipment. The new NFPA 110 Handbook PDF includes the full text of the Standard, new explanations, and full-color imagery. Gain electronic access to the complete 2016 NFPA 110 text. This edition adds new verification tests and maintenance for paralleling gear that requires the entire backup emergency system be tested to ensure the paralleling gear functions as intended. Hyperlinked icons take you to answers that help you avoid errors that could jeopardize safety. Link directly to commentary written by experts with an in-depth knowledge of NFPA 110. Get the big picture with a dedicated Table of Contents for sections with commentary. Find chapter introductions only in the Handbook. Best value: Save 15% on the print NFPA 110 Standard and NFPA 110 PDF Handbook Set! Interested in the 2013 or 2010 editions of the NFPA 110 Handbook? Use the drop down menu above to select the edition year you need.